Human Rights should NOT be something we pay for! Smokey Thomas put it best today ! Toronto – The Premier of Ontario needs to clear up the confusion around how she views human rights, especially the right of workers to receive equal pay for equal work regardless of gender, the President of the Ontario Public Service Employees Union (OPSEU) says. At a news conference today, Warren (Smokey) Thomas said a recent arbitration award at the LCBO that stripped certain collective agreement provisions to offset the cost of equal pay for equal work was “a blatant violation of the most basic principle of human rights. Thomas said the recent arbitration award came after the LCBO put forward a list of concessions designed to cover the cost of providing equal pay to workers in the female-dominated casual Customer Service Representative classification. “Equal pay is supposed to mean raising the bar for those not receiving fair wages, not lowering the standards and working conditions of their co-workers,” Thomas said. “This idea of horse-trading for rights seems to be what the LCBO thinks Premier Wynne is looking for. So we need to know: is LCBO management wrong, or did the Premier or her ministers direct them to find a way to make LCBO workers pay to have a human right recognized? OPSEU represents 7,500 workers at the Crown agency. Their collective agreement expires March 31, 2017. Fact Checklist. Don’t believe what they tell you. Call OPSEU and check the facts! The matters in dispute proceeded to a hearing in Toronto on March 21, 2017. Effective date of award, and notwithstanding LOU re Agency Stores, for every agency store that is repatriated the employer may open a new agency store. Repatriation and to include it in their collective agreement. It was agreed at the hearing, and at the request of the parties memorialized here, that nothing in this award in any way affects the ability and entitlement of either party to make bargaining proposals in the current round. At the request of the parties, I continue to remain seized with respect to the implementation of my award. DATED at Toronto this 27th day of March 2017. This year was a busy one for OPSEU members at the LCBO. The New Year will be even busier! The OPSEU Liquor Board Employees Division (LBED) has been hard at work in 2016, delivering a strong campaign against the privatization of our work. But as we turn the corner into 2017, it’s time to make way for contract negotiations between the LCBO and your OPSEU bargaining team. Our collective agreement expires on March 31, 2017. “We’ve already spent months getting ready to bargain,” says Denise Davis, chair of the LBED bargaining team. “We’ve elected our bargaining team, we’ve set our demands, and we’ve started laying the foundation for our next contract. Bargaining in this round will officially begin on February 20, 2017. But before it does, the LCBO and OPSEU must iron out the details of an historic agreement reached November 1 to settle a major human rights complaint. As a result of that agreement, customer service representatives (CSRs) working as casuals in LCBO stores and depots will soon be placed on a new wage grid. This new grid will allow them to reach the same top pay rate earned by permanent part-time and permanent full-time CSRs. This settlement represents a huge victory for more than 4,000 casual CSRs. All CSRs – casual, permanent part-time, and permanent full-time – will be on the same pay grid. All the details of the new pay grid will be negotiated between OPSEU and the LCBO. If OPSEU and the LCBO cannot agree, all outstanding issues will be decided by arbitrator William Kaplan, and his decisions will be legally binding on both parties. No CSR will see her or his pay go down as a result of the settlement. Negotiations are currently under way, and the outstanding issues will be decided before bargaining of the new collective agreement begins. The parties have agreed to a “blackout” on these talks. Neither of the LCBO and OPSEU will be releasing details until a final settlement is reached, either through negotiations or by order of the arbitrator. For more details of the November 1 agreement, read our Q&A. So far, OPSEU and the LCBO have agreed to 17 dates for negotiations: February 20-24, March 6-10, April 3-5, and April 10-13. The OPSEU bargaining team is optimistic about this round, says bargaining team Chair Denise Davis. You can receive this bargaining bulletin (and our regular newsletter, the Echo) directly by e-mail. Just call OPSEU at 1-800-268-7376 or (416) 443-8888, and give the operator your name and e-mail address. You can also watch for updates on the OPSEU website at www.opseu.org. And be sure to attend upcoming bargaining information meetings in your area. The LCBO Employee Assistance Program is a confidential, hassle-free counseling service for eligible LCBO employees and their immediate families. For assistance, call 1-800-263-1401. There was a Final Demand set meeting at the Eaton Chelsea Hotel in Toronto. There were 3 Delegates (including the local president) that attended on behalf of our local. On October 30, 2017, OPSEU called a General Membership Meeting. We are still waiting for minutes from the Local Secretary and Local President. There has been a settlement for casual’s “Pay in Lieu” grievance. Click on the attached link. The day the middle class died!! I have to share this story. It is so true and really hits home for me. And here is the story…. From time to time, someone under 30 will ask me, “When did this all begin, America’s downward slide?” They say they’ve heard of a time when working people could raise a family and send the kids to college on just one parent’s income (and that college in states like California and New York was almost free). That anyone who wanted a decent paying job could get one. That people only worked five days a week, eight hours a day, got the whole weekend off and had a paid vacation every summer. That many jobs were union jobs, from baggers at the grocery store to the guy painting your house, and this meant that no matter how “lowly” your job was you had guarantees of a pension, occasional raises, health insurance and someone to stick up for you if you were unfairly treated. 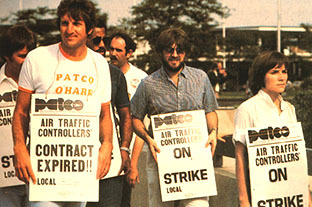 On August 5, 1981, President Ronald Reagan fired every member of the air traffic controllers union (PATCO) who’d defied his order to return to work and declared their union illegal. They had been on strike for just two days. Beginning on this date, 30 years ago, Big Business and the Right Wing decided to “go for it” — to see if they could actually destroy the middle class so that they could become richer themselves. On August 5, 1981, President Ronald Reagan fired every member of the air traffic controllers union (PATCO) who’d defied his order to return to work and declared their union illegal. They had been on strike for just two days. It was a bold and brash move. No one had ever tried it. What made it even bolder was that PATCO was one of only two unions that had endorsed Reagan for president! It sent a shock wave through workers across the country. If he would do this to the people who were with him, what would he do to us? Reagan had been backed by Wall Street in his run for the White House and they, along with right-wing Christians, wanted to restructure America and turn back the tide that President Franklin D. Roosevelt started — a tide that was intended to make life better for the average working person. The rich hated paying better wages and providing benefits. They hated paying taxes even more. And they despised unions. The right-wing Christians hated anything that sounded like socialism or holding out a helping hand to minorities or women. * Everyone must work! Mom, Dad, the teenagers in the house! Dad, you work a second job! Kids, here’s your latch-key! Your parents might be home in time to put you to bed. * 50 million of you must go without health insurance! And health insurance companies: you go ahead and decide who you want to help — or not. * Unions are evil! You will not belong to a union! You do not need an advocate! Shut up and get back to work! No, you can’t leave now, we’re not done. Your kids can make their own dinner. * You want to go to college? No problem — just sign here and be in hock to a bank for the next 20 years! * What’s “a raise”? Get back to work and shut up! The biggest organization of unions in America told its members to cross the picket lines of the air traffic controllers and go to work. And that’s just what these union members did. Union pilots, flight attendants, delivery truck drivers, baggage handlers — they all crossed the line and helped to break the strike. And union members of all stripes crossed the picket lines and continued to fly. And that was the beginning of the end. Reagan and the Republicans knew they could get away with anything — and they did. They slashed taxes on the rich. They made it harder for you to start a union at your workplace. They eliminated safety regulations on the job. They ignored the monopoly laws and allowed thousands of companies to merge or be bought out and closed down. Corporations froze wages and threatened to move overseas if the workers didn’t accept lower pay and less benefits. And when the workers agreed to work for less, they moved the jobs overseas anyway. And at every step along the way, the majority of Americans went along with this. There was little opposition or fight-back. The “masses” did not rise up and protect their jobs, their homes, their schools (which used to be the best in the world). They just accepted their fate and took the beating. I have often wondered what would have happened had we all just stopped flying, period, back in 1981. What if all the unions had said to Reagan, “Give those controllers their jobs back or we’re shutting the country down!”? You know what would have happened. The corporate elite and their boy Reagan would have buckled. But we didn’t do it. And so, bit by bit, piece by piece, in the ensuing 30 years, those in power have destroyed the middle class of our country and, in turn, have wrecked the future for our young people. Wages have remained stagnant for 30 years. Take a look at the statistics and you can see that every decline we’re now suffering with had it’s beginning in 1981 (here’s a little scene to illustrate that from my last movie). Have we all just given up? What are we waiting for? Forget about the 20% who support the Tea Party — we are the other 80%! This decline will only end when we demand it. And not through an online petition or a tweet. We are going to have to turn the TV and the computer and the video games off and get out in the streets (like they’ve done in Wisconsin). Some of you need to run for local office next year. We need to demand that the Democrats either get a spine and stop taking corporate money — or step aside. When is enough, enough? The middle class dream will not just magically reappear. Wall Street’s plan is clear: America is to be a nation of Haves and Have Nothings. Is that OK for you?